COME TO THE RALLY AND HEARING ON EARNED SICK DAYS! 2 out of every 5 workers in Philadelphia do NOT have a single paid sick day. Help Us Tell City Council to Give ALL Workers a Chance to Earn Paid Sick Days. Join the Coalition for Healthy Families and Workplaces at City Hall for a Rally and Press Conference and then help us pack the Hearing Room to show the importance of this bill. Enter City Hall at the north-east corner and remember to bring a picture ID. Even if you have paid sick days remember a majority of restaurant, child care, and health care workers do not—the lack of paid sick days in Philadelphia impacts us all! "Single-parent families are hardest hit. A single mother in Chester County with one infant preschool child needs to earn $69,613 yearly to be self-sufficient, according to the most recent survey performed by Pathways Pa., an organization whose goal is to keep low-income, vulnerable women together with their children. Self-sufficiency measures the real costs of meeting basic needs and is meant to assess the costs facing working-age, nondisabled and nonelderly households." This position will coordinate and provide data management and support in preparation for, during, and after the 20010/11 tax season. Site Coordinator experience preferred. This position coordinates scheduling of tax sites and preparers and also trains tax season staff and volunteers. Bachelor’s Degree required. Familiarity and commitment to helping low-income/TANF recipients preferred. This is a 6-7 month position beginning in January. Please fax resumes to: LD/EITC at 610-543-6483. Full-Time – Seasoned instructor to teach reading, writing, math, ESL, GED® prep and computer basics in North Philadelphia and Delaware County. Bachelor’s Degree and 2 years of teaching adults or children required. Strongly prefer instructor who has experience with the EL/Civics program sponsored by the state Bureau of Adult and Basic Education. Some evening work required. Must have access to reliable transportation. Training in CASAS and TABE preferred. From our friends at AmeriCorps Alums. This weekend, the House passed H.R. 1, legislation that would make deep cuts in government spending for the rest of the fiscal year. The measure – which eliminates AmeriCorps -- passed 235-189. After hearing the news that AmeriCorps was being threatened, AmeriCorps alum Caleb Jonas decided he had to do something. From a coffee shop in Massachusetts, Caleb created a petition asking Congress to "Save AmeriCorps.” Caleb’s inspiring alumni action has already been signed by 40,000+ Americans -- without significant promotion from any major organization. Until now. Your signature will help AmeriCorps Alums and Caleb reach his goal of 85,000 signatures -- one signature for every AmeriCorps member currently serving their country. DEADLINE: Thursday, 5 p.m.
Join the Coalition for Healthy Families and Workplaces at City Hall for a Rally and Press Conference and then help us pack the Hearing Room to show the importance of this bill. If you have a story about how having or lacking paid sick days has impacted you please email kscully@pathwayspa.org. In addition please take a few moments to write a letter to your members of City Council. Over the weekend, the House cut $60 billion from the remaining budget for the fiscal year, according toThe New York Times. Since the Senate is not expected to follow suit, Congress only has four days next week to come up with a bill to fund the federal government for the remainder of the fiscal year. If no agreement is reached, the government could enter a shutdown in early March. Elimination of financing for Planned ParenthoodProhibition of the EPA from regulating greenhouse gasesProhibition of financing for health care lawProhibition of financing to enforce the insurance mandateRestoration of financing for special educationReduction of EPA financing by $8.5 millionAmong amendments that were rejected was a restoration of $50 million in LIHEAP funding and a reduction of Amtrak financing. This coming March marks the 15th year that National Women’s History Month is being celebrated in the United States. This important designation, which started as Women’s History Week in Sonoma County, CA, in 1978, has grown into a celebration of women throughout the country. This year’s National Women’s History Month theme, “Our History is Our Strength,” focuses on the tenacity, courage, and creativity of women and how these skills led to important historical achievements. It pays tribute to the millions of women who have taken action to improve the lives of other women, both in their own era and for future generations. This National Women’s History Month also marks the 100th Anniversary of International Women’s Day (March 8) and the 100th Anniversary of California women winning the right to vote. Apologies for not writing about this sooner, but the Policy Department has been in the midst of attending a national conference and preparing for a local hearing on earned sick time. While we were busy, a budget proposal for the rest of the fiscal year (from March 4 until September 30) was announced, as well as President Obama's proposed budget for 2012. Note: Congressional Staffers are also looking for your thoughts on HR 1. A new service, POPVOX, is among organizations collecting statements. To learn more about POPVOX, please visit https://www.popvox.com/home. Also, The New York Timeshas put together a graphic representation of the federal budget proposal, showing the various cuts and increases to spending. You can check it out on their website. Here is a roundup of budget information that we have gathered from our friends and colleagues. Tell us about more in the comments! STOP THE ATTACKS ON WOMEN’S HEALTH CARE! Legislation in both Harrisburg and Washington DC aims to stop women from using their own money to purchase health insurance that covers abortion.Some members of Congress are proposing to entirely eliminate all federal funding for family planning and reproductive health services which will lead to more unintended pregnancies. They are also proposing deep cuts in federal funding for maternal and child health. The House of Representatives is poised to pass a bill which will cut $100 billion from the current-year federal budget, with most reductions focused on federal support for basic health and human services for vulnerable Americans. Has Your Organization Been Impacted by the State Budget? Take This Survey! The United Way of Pennsylvania, The Southeastern Pennsylvania Budget Coalition, and many other organizations are circulating a survey to gauge the impact of state budget cuts to organizations across Pennsylvania. Please take a moment to answer this short, 12 question survey about the impact of cuts on your organization! 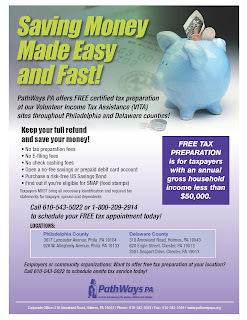 Path Ways PA offers FREE certified tax preparation at our Volunteer Income Tax Assistance (VITA) sites throughout Philadelphia and Delaware counties! FREE TAX PREPARATION is for taxpayers with an annual gross household income less than $50,000. Call 610-543-5022 or 1-800-209-2914 to schedule your FREE tax appointment today! Keep your full refund and save your money!No tax preparation feesNo F-filing feesNo check cashing feesOpen a no-fee savings or prepaid debit card accountPurchase a risk-free US Savings BondFind out if you’re eligible for SNAP (food stamps)Taxpayers MUST bring all necessary identification and required tax statements for taxpayer, spouse and dependents. 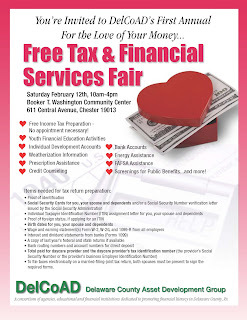 All are invited to attend DelCoAD's first annual Financial Services Fair at the Booker T. Washington Community Center in Chester on Saturday, February 12th from 10am-4pm at their premiere site, Chester Housing Authority's Booker T. Washington Community Center, 611 Central Avenue in Chester. DelCoAD, sponsored by Philadelphia Higher Education Network for Neighborhood Development (PHENND) and the United Way of Southeastern Pennsylvania, is a member of the National Community Tax Coalition. This weekend PathWays PA spoke at WOMEN'S WAY's Women in Influence Conference at a session entitled the How and Why of Social Media in Advocacy. Below is our powerpoint presentation that includes examples of the ways PathWays PA uses social media to advance our work and inform the public about important issues. Today the House Health Committee will be voting on HB 42, a bill that would prohibit Pennsylvania from implementing a key part of the federal Affordable Care Act. HB 42 prohibits implementation of health care reform based on the individual mandate of the new law.